In the past, Toshiba's multimedia Qosmio laptops have impressed us, but it's been a long time since the range was refreshed. The X300-11S (£1199 inc. VAT) brings a new design and marks Toshiba's ﬁrst dedicated gaming laptop, but it's not without ﬂaws. 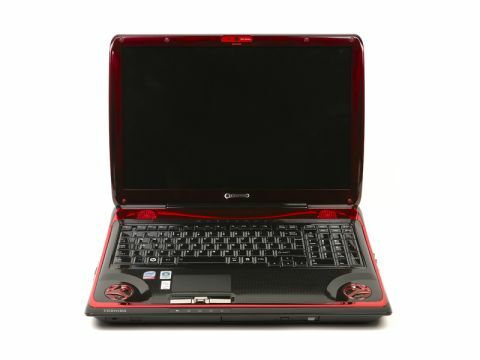 The bright red and black design scheme and ﬂame decals suit ﬂamboyant gamers, but may not be to all tastes. The large 4.1kg chassis is very heavy and bulky. Equally, the 95-minute battery life means it's strictly designed for home use. The full-size keyboard is fairly well-ﬁxed but has a slightly hard typing action. Unfortunately, all the keys are glossy and highly-reﬂective, so it can be tricky to see which key is which in bright conditions. A full panel of number-keys is also in place for easy gaming and data input use. Powerful performance is provided by Intel's Centrino 2 technology and 4096MB of memory. Due to the low battery life, we were unable to obtain a benchmark score, but during use it delivered impressively powerful and reliable performance. Gaming is its real strength, however. The nVidia GPU provides more than enough power for running the latest 3D games smoothly and reliably, and there's ample power for high-performance HD video and photo-editing tasks. Unfortunately, multimedia features are where the Qosmio is ﬂawed. The lack of a Blu-ray drive is unfortunate but inevitable, since the format pushed Toshiba's own HD DVD format out of the market. As a result, HD content must be played back from the Qosmio's hard drive. The vibrant 17-inch Super-TFT screen compensates somewhat. Colour and brightness are outstanding and DVDs, photos and videos look great. For the full home cinema experience, the HDMI-out port lets you easily connect to an HDTV for a bigger picture. Audio performance is also reliably strong. A ﬁve-speaker setup from audio specialist Harman Kardon has been used. While it can't compare to a full dedicated speaker system, music, movies and games all sound great and it adds to the multimedia usability. Storage is strong, but not the best we've seen. The 320GB hard drive will be ample for most needs, as will the dual-layer DVD rewriter. The 5-in-1 media card reader provides support for the most common Flash storage formats to let you share ﬁles with digital cameras and PDAs. While the Toshiba Qosmio X300-11S succeeds as an eye-catching, powerful and affordable gaming laptop, it's ﬂawed for full multimedia use. The lack of HD-compatibility is unfortunate at this price; so before your buy, make sure this isn't a feature you'll miss in the future.